Greetings, Stampers! I am glad to say that all my Holiday cards are now completed, addressed, and in the mail, woo hoo! 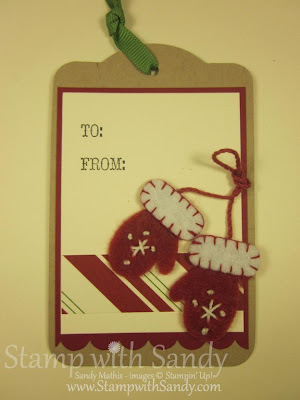 As a result, I thought I'd spend this week focusing on "not a card" holiday projects, such as gifts, bags and tags. The tags shown above are ones that were made in my Bags & Tags class last week. 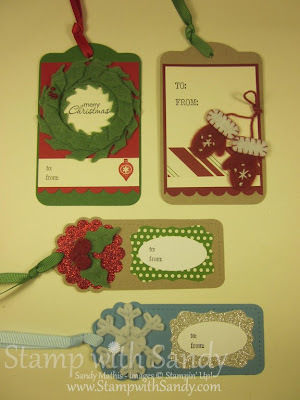 The tags all use Winter Wishes Stitched Felt adornments, which I scooped up on the clearance rack recently. And I have good news, as of the date of this post, they are still available! Following are close up shots of each tag. The base of each one was made using the Two Tags Die. Some feature Chock Full of Cheer Designer Series Paper, and others use Silver or Red Glimmer Paper. 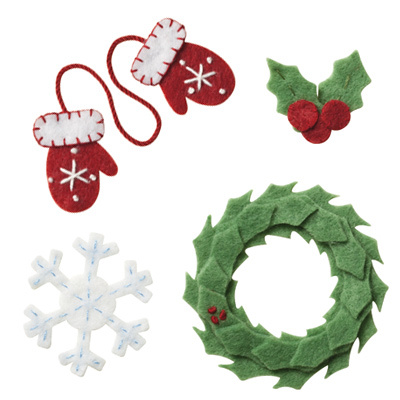 Each one has a felt adornment. I used Tombo Liquid Glue to attach the felt pieces to the card stock, which worked great. However, to adhere the felt to the Glimmer Paper, some Mini Glue Dots were necessary. Everything else was attached with Snail adhesive. 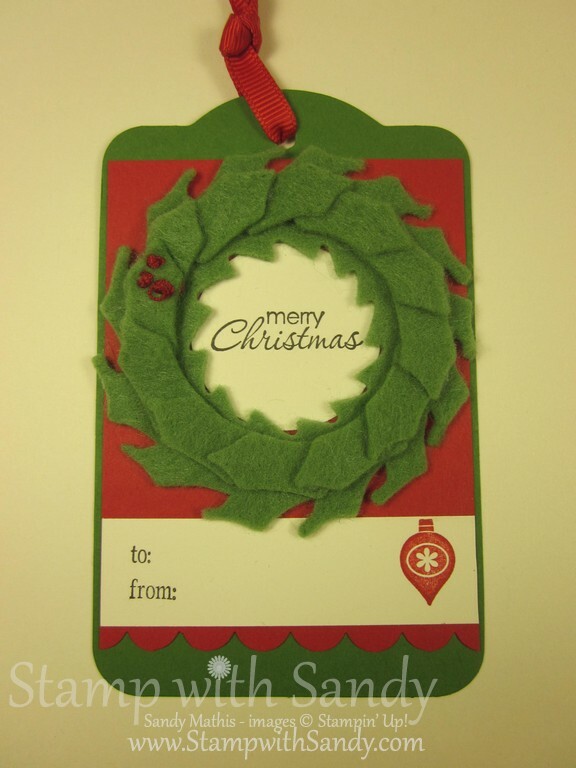 The greeting behind the wreath on this tag was stamped and then punched out with a 1 3/8" circle punch, which fits perfectly behind the wreath. The larger tags already had a hole for the ribbon cut when you run the die through the Big Shot. I used a Cropadile to cut the holes on the smaller tags. And I have more good news, the Cropadile is on the Clearance Rack, too! Sandy, the timing of your post is perfect! I am working on tags right now and have some of those wonderful felt pieces too! I love how you used all of them on the tags! I do have one question. 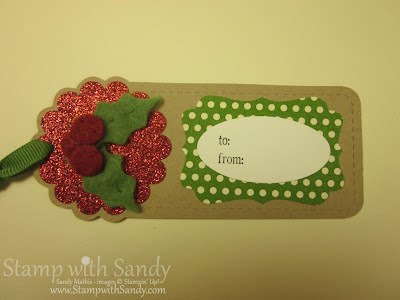 What did you use to make the scallop circle on the holly tag. My scallop circle punch is the same size as the tag's scallop and I'm not aware of one that's just a little smaller. Am I missing something?